On Saturday before Easter we had a party for the children at our church. There was an Easter Egg hunt of course, and some games and prizes. Our daughter Jennifer did face painting and I was in charge of the stick on tattoos. The girls generally choose something pretty and we had flowers, butterflies and such things for them. The boys wanted something a bit darker so we offered pirates, skulls, dragons and such for them. Of course I had to apply one to the back of my hand as a sample for them and a practice for myself. 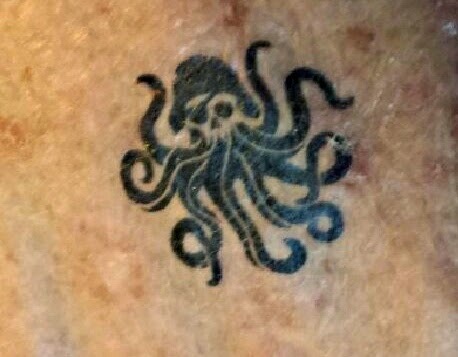 I choose this lovely Pirate Octopus to decorate the back of my hand. The interesting thing about these tattoos is that they do not wash off as expected. They are printed on a very thin plastic film that slips off a paper backing when wet and applied to the skin. I am posting this on Monday morning and mine is still firmly affixed. I will try some mineral oil or some of Sue's fingernail polish remover. The kids loved them. arrrggghhh matey! 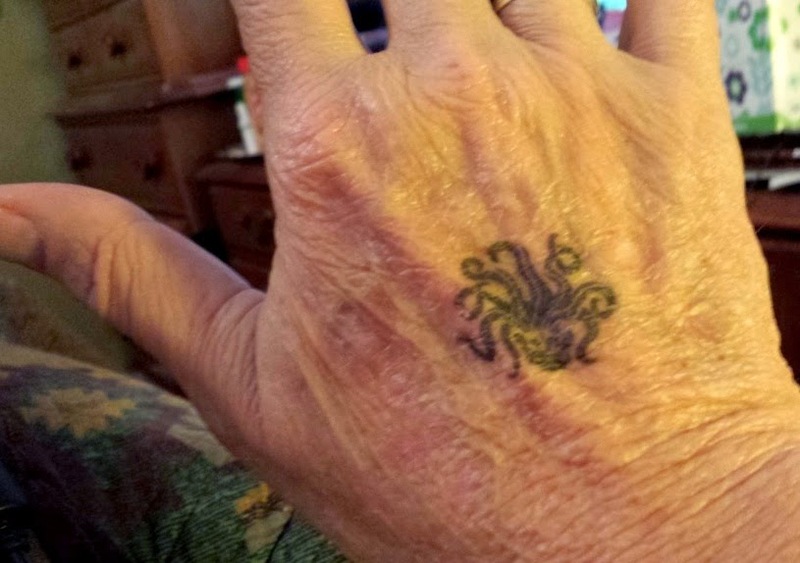 remember those tattoos that came in the cracker jack boxes of zoo animals! i loved those! All the fun, no pain. One hip Grandpa!! How fun for the parents! I think it's quite adorable.